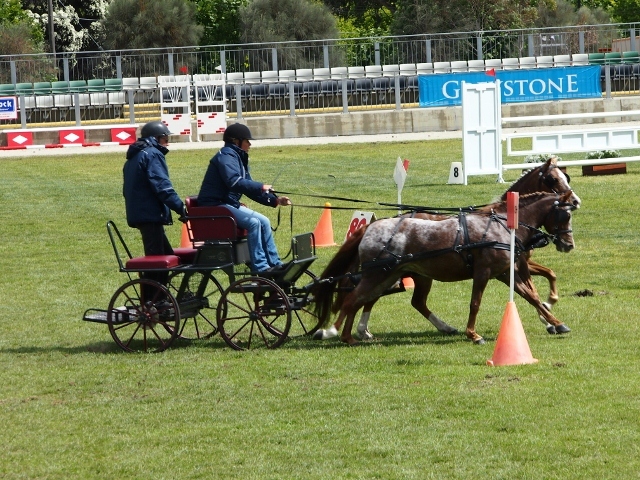 Last Friday I scooted off to the Melbourne showgrounds for Equitana, Australia’s “Premier Equine Extravaganza” and full-on horsey-fest. I’ve never been to one of these before and had no idea how huge it would be. 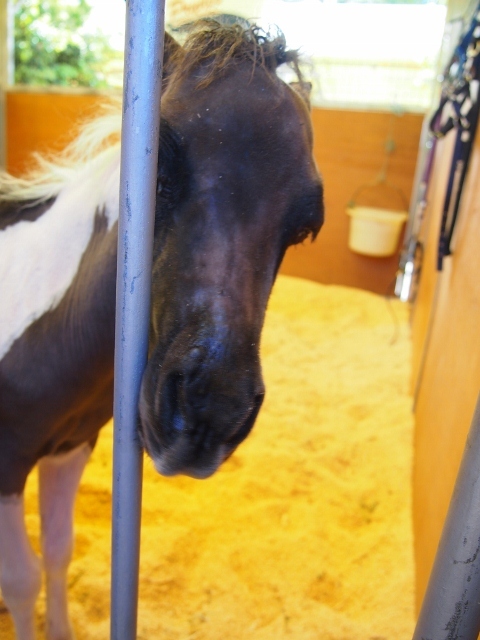 The place was packed, not just with people but with stalls and demonstrations and everything you can imagine related to horses. In other words, bliss! 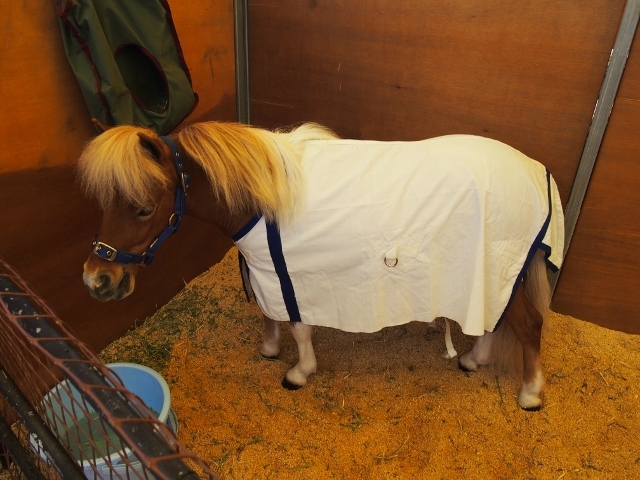 Too cute for words horses! 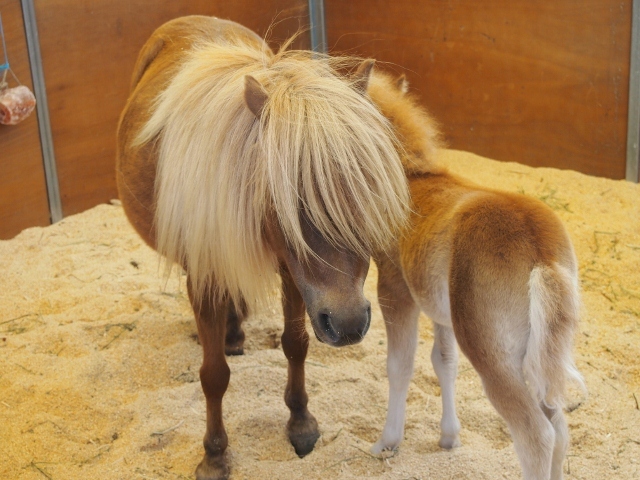 Superstar horses. 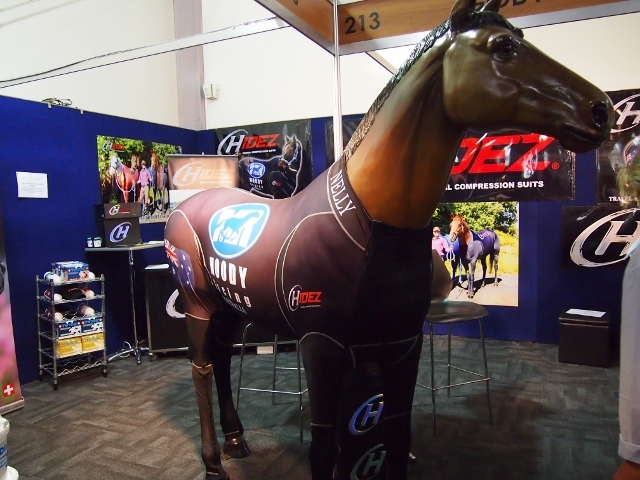 Well, Black Caviar’s (aka Nelly) compression suit anyway. And by the end of the day, this is exactly how I felt. Zzzzzz. 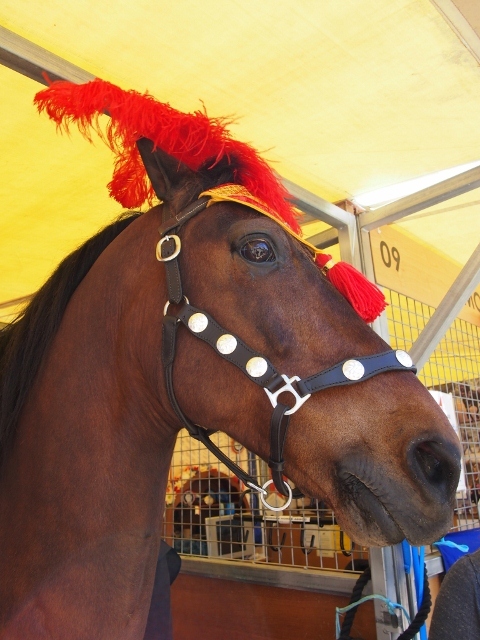 This entry was posted in This Writing Life and tagged Equitana, Horses, Melbourne, This writing life on November 21, 2012 by cathrynhein. It’s Spring Racing Carnival time and Friday Feast is frocking up! 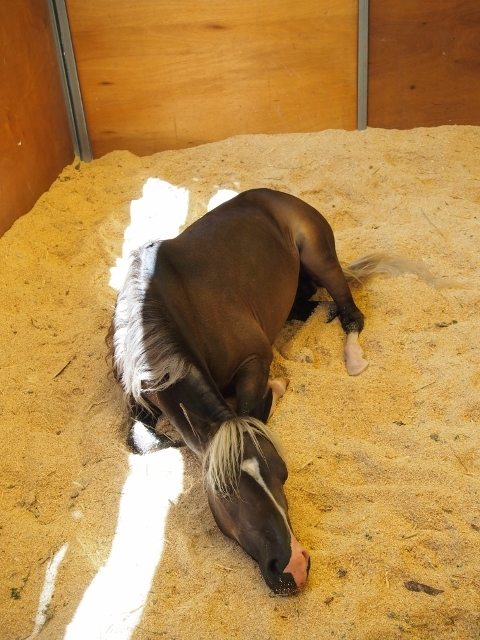 Well, not quite, but things are starting to smell sweetly horsey around here. Rightly so, too! Rotten cats keep taking over the blogosphere and it’s about time that our noble and magnificent equine friends kicked back. I am absolutely delighted to welcome our very first non-fiction author to Friday Feast. Not just any old non-fiction author, mind you. That simply wouldn’t do. Friday Feasts only feature the best Australian authors and today is no exception. 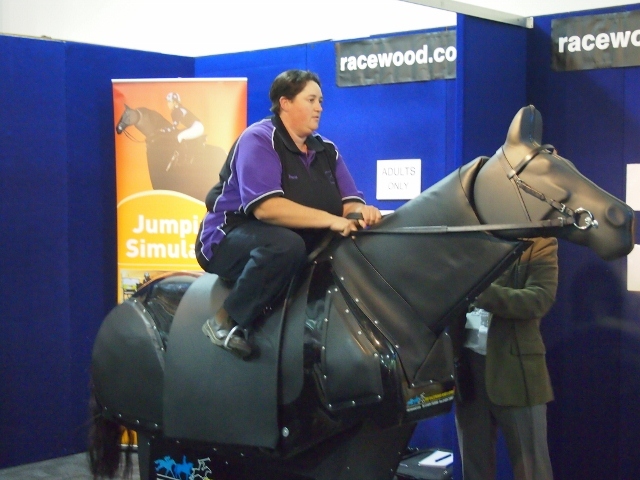 Jessica Owers is an award-winning freelance racing journalist who has worked for such illustrious publications as Breeding and Racing and RM Williams OUTBACK magazine. Among many other achievements, her writing has also appeared in Inside Breeding, The Thoroughbred, Turf Monthly, OUTBACK and Racing Life. In 2011, her book Peter Pan: The Forgotten Story of Phar Lap’s Successor was released to great acclaim, going on to win the Bill Whittaker Award for Best Racing Book in Australia 2012. Take a look and you’ll see why. This is a story we should know! In 1932, they said there would never be another Phar Lap. Yet within months there came a racehorse so wildly brilliant that he was instantly compared to the dead champion. He was Peter Pan. Within months of Phar Lap’s death, Peter Pan had won the Melbourne Cup and then two years later, won it again – the first horse in 72 years to take home a second. The newspapers of the day called him a ‘superhorse’ and declared ‘another Phar Lap takes the stage.’ But over the long years, Australia forgot their new champion. 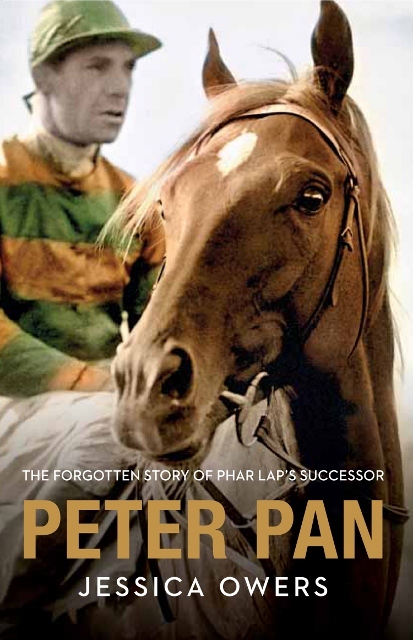 Peter Pan: The Forgotten Story of Phar Lap’s Successor is the tale of the horse that came next – the brilliant, speedy Peter Pan. Casting off the shadow of Phar Lap, this tells the story of triumph during the Great Depression and the coming of a champion when Australia least expected one. It is time to restore the standing of our other great racing hero. 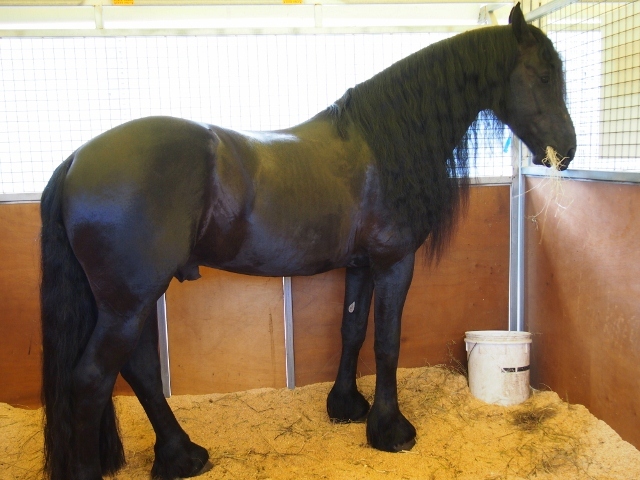 Oh, I do love a good horse story and I’m sure you will too, especially one so expertly written. Peter Pan is available now with just a short click over to Booktopia, Bookworld or Book Depository, or for the ebook, try Kobo, Google Play or Amazon Kindle. Now giddy-up, Feasters, because here’s Jessica! At this colourful time of year when it’s all about Spring Carnival, I’m thrilled to guest blog on Cathryn’s ever-popular Friday Feast. The events detailed below occurred during a recent research trip to the U.S. for my second book, the biography of Shannon, a 1940s Sydney idol and one of racing’s most captivating and least-understood Hall of Fame racehorses. His book is due out spring next year. It was very hot, and lazy early afternoon. I was on highway I-87 in upstate New York, rolling my rented wheels towards Saratoga Springs. It was the kind of day that makes you want to drive with your hand out the window, feel the brisk whip of wind through the car. I’d had a radio interview from my hotel room that morning, and it had gone overtime. Within minutes of hitting the road to the Spa (Saratoga Springs is affectionately called ‘the Spa’), I was starving. Highway food is never the best, is it? It’s usually a select choice of greasy or greasier, fat or fattier. On that day, I skipped past iHop, Chucky Cheese and Wendy’s, none of which took my fancy. There’ll be something better, I kept saying, then miles of blacktop slipped under the car. My stomach began to eat its own lining. 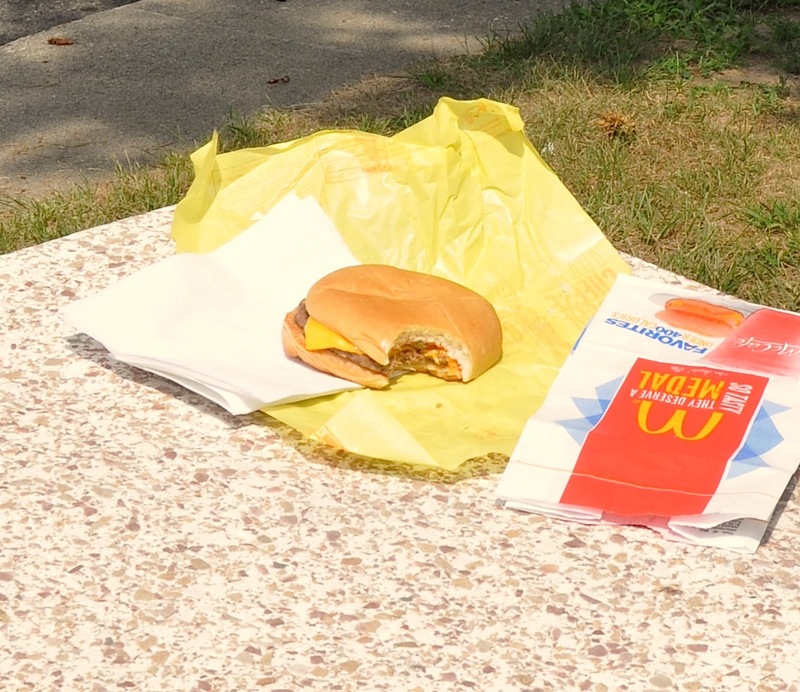 Eventually, a state of famish will make you eat anything, so when an exit pointed to McDonald’s, I eased the rental off the highway and went in search of the golden arches. I knew that it was a fast fix, that in this heat McDonald’s food would leave me feeling disembowelled. But, food was food. I was just too hungry to care. The first thing I’ll tell you about this McDonald’s was that it was spotless. It was the prettiest renewal of this franchise I had ever seen… neatly mowed lawns, a picnic area to gobble your takeaway. At the drive-in window there was an apple tree, stooped and splendid with fruit. The place was so unlike any McDonald’s I’d ever been to that it made me forget entirely the acrid food I was about to purchase. I bought a single cheeseburger, that’s all. I didn’t upsize or meal deal. I didn’t need anything to wash it down. 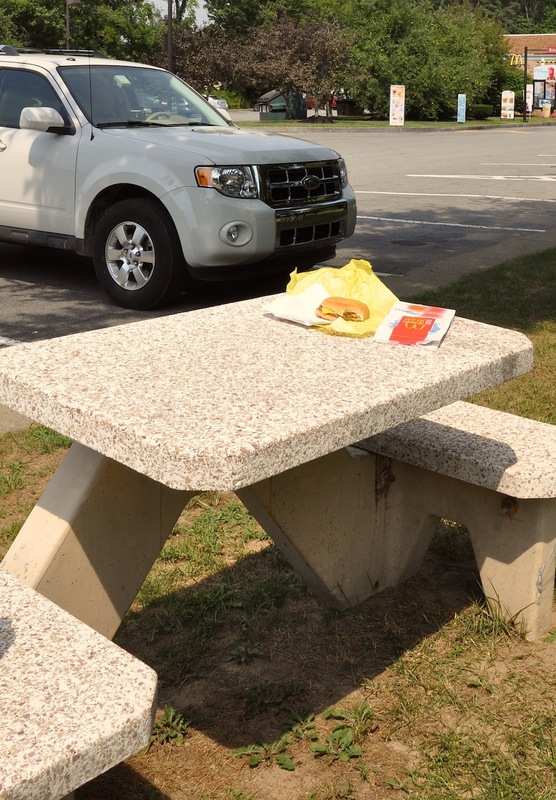 All I required was a little bit of fuel that would turn my vitals over until Saratoga, and so I took my little cheeseburger, wrapped in a small paper bag like something from 1977, and I parked in the picnic lot. I climbed out into the stale August afternoon, hair-dryer hot, and I tucked in. Now, every once in a while life takes you by surprise. This was one such day. My little cheeseburger was delicious. It had been put together so well it looked like its brothers up on the ordering board (well, almost). The gherkins, perfect green frisbees, were tucked between the bun and the beef, each (there were three) sliced and diced perfectly. Whoever put them in there put them in carefully. There was nothing mushy about the burger, it was the perfect harmony of lightly melted plastic cheese and ketchup in spot-on quantities. It was the kind of cheeseburger to call home about, the kind to write a blog about. When Cathryn asked me to guest on the Friday Feast, I just knew my little cheeseburger had to be the star of the show. My fiancé (an Italian restaurateur) will be mortified. Though my cheeseburger cannot compete with the impressive efforts of past guests, creators of gnocchi and chocolate surprise, exotic recipes from colonial Africa even, there’s something cool about it, something basic, don’t you think? The McDonald’s cheeseburger is the thing we’ve all had. It’s usually terrible, slapped up and messy and rundown with guilt, but when you get a good one, oh its good. So, at this point in the blog I’m supposed to outlay the recipe of the divine wonder you’ve just read about. However, because the McDonald’s cheeseburger is neither a recipe nor divine, I’ll have to skip that part. Instead, I’ll tell you why my highway cheeseburger, though it fell down in nutritional talent, stood up in other ways that only a writer could isolate: it represented a brief stop on a long and fabulous holiday, a stop on the open road one hot, oily afternoon when I had few woes and only the itchy pursuit of the bending highway. It represented the brief, good things in life, the little things, and certainly reminded me that the best things in any moment of any day can come (almost) free… $1.06 is pretty good going, don’t you think? Shocked and repulsed that a lowly cheeseburger has made it onto the fabulous honour roll that is the Friday Feast? Or, delighted that something so basic can be so good every once in a while? To win a signed copy of Peter Pan: The Forgotten Story of Phar Lap’s Successor, reply with your version of when something so bad has been so surprisingly good. The best answer will get a copy of Peter Pan spirited to them right in time for Melbourne Cup day. Oh, I so, so adore this story! It’s amazing how much pleasure you can derive from simple things. Fish and chips on the beach. A luke-warm pie at the footy (supporting the Sydney Swans, of course). Not exactly health food, but hitting the spot perfectly. So come on, Feasters, show our first non-fiction author a good time and regale Jessica with your tales of bad-good things. There’s an amazing prize up for grabs! Giveaway closes midnight Tuesday, 25th September 2012 AEST. Australian addresses only, sorry. If you would like to learn a little more about Australia’s strongest female voice in racing writing, visit Jessica at her website, check in on the blog or follow her on Twitter. This entry was posted in Friday Feast and tagged Australian Authors, Australian Writers, Bill Whittaker Award, book giveaway, Booktopia, Cathryn Hein, cheeseburger, Food, Friday Feast, Horse Racing, Horses, Jessica Owers, Melbourne Cup, Peter Pan, Phar Lap, promo, Spring Racing Carnival on September 21, 2012 by cathrynhein.